My summer holiday started with a blast. Some of my friends are real opera connoisseurs and they invited me and my wife to experience Otello, a true operatic masterpiece of the Romantic era, composed by the great Italian composer Giuseppe Verdi (1813-1901). The libretto was provided by poet and musician Arrigo Boito (1842-1918), the play itself of course being one of William Shakespeare’s tragedies (in English written as Othello, Italian Otello). René Girard wrote a very interesting book on Shakespeare’s oeuvre, A Theater of Envy. Chapter 31 of this book deals with Othello, entitled Shall we desire to raze the sanctuary? Desire and Death in Othello and other plays. The main characters of Othello are indeed driven by jealousy, by envy – a ‘force’ biblically and traditionally identified with ‘Satan’ or ‘the Devil’. Girard describes envy as the negative side of ‘mimetic’ or ‘imitative’ desire. When a desire is mimetic, it means this desire is based on the imitation of someone else’s desire. We often desire what others desire or possess, not because we intrinsically want to obtain a certain object or goal, but because we more or less unwittingly imitate each other’s desires. An imitated ‘other’ becomes a ‘model’ – someone who is admired – and an ‘obstacle’ at the same time – someone who is envied because of what he owns or is supposed to own; someone who ‘stands in the way’ between the mimetically created subject and object of desire. What strikes me the most in Act III, from a dramatic point of view, is Otello’s refusal to listen to his wife. He considers listening to her as taking advice from the devil. At this point in the libretto, Arrigo Boito refers to the Medieval Catholic formula for exorcisms, “Vade Retro, Satana” (recorded in a 1415 manuscript found in the Benedictine Metten Abbey of Bavaria). Otello sings “Indietro!” (“Aback!”), an important word that is not translated in the fragments shown. The aforementioned formula as well as this word are similar to Jesus saying to Peter “Get behind me, Satan” in Mark 8:33 or Matthew 16:23. There, Jesus refuses to listen to Peter because Peter tries to seduce him to compete with ‘the rulers of this world’. In other words, Peter takes the role of ‘Satan’, meaning that he tries to trick Jesus into ‘mimetic rivalry’. Peter tries to trick Jesus into enviously comparing himself to others ‘to protect himself’. 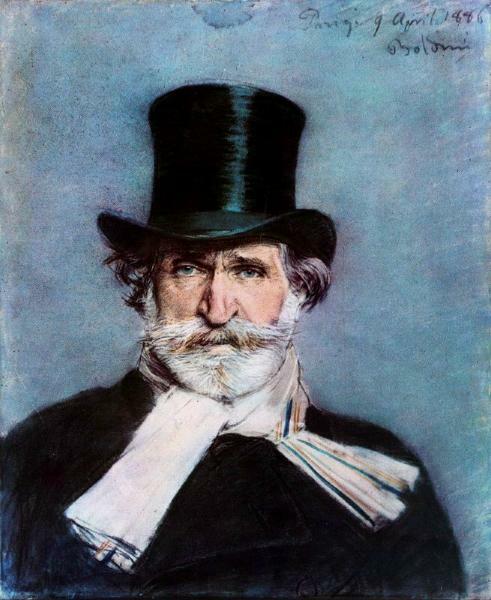 With this in mind the tragic irony in Act III of Verdi’s Otello becomes obvious. Otello’s paranoia has become so powerful that he is no longer capable of hearing the truth. The truth is Desdemona is innocent, but she becomes the victim, the ‘scapegoat’ of Otello’s anxieties and frustrations. Otello believes he’s denouncing ‘Satan’, but in fact he actually takes advice from Iago’s hints and is consumed by envy.